If you are looking for information on the Have Signs Will Travel franchise business opportunity, Have Signs Will Travel franchises or Have Signs Will Travel franchising, then you have come to the right place. Have Signs Will Travel is the ultimate sign franchise. We revolutionized the sign industry by providing our customers with the convenience of On-The-Spot Sign Manufacturing. Have Signs Will Travel is a self contained, state-of-the-art, full service sign store, on wheels. Each of our stores are independently owned and operated, yet offer the consistency, quality and convenience that is expected in the Have Signs Will Travel name. We offer a vast array of signs and services and our ability to design and manufacture signs right at your location, letter a truck at a work site or apply a new name on a boat while it's in the water, makes us #1. Yesterday to Today: In 1996 we designed and built a self contained sign manufacturing truck. Through the years many changes have been made and the newly designed sign truck of today is a state-of-the-art piece of equipment that has no equal. A Full Service Sign Shop ... With A Twist! Have Signs Will Travel is a self contained, state-of-the-art, full service sign store, on wheels. In today's ever changing world, mobility and convenience play a defining role in the service industry. We pride ourselves on our ability to deliver our services to our customers in an efficient and cost-effective manner. Join the Have Signs Will Travel team and be part of an industry that is over $8 billion strong. As a mobile sign store owner you will be able to offer your customers everything the other guys can in a way that the other guys can't. As a home based business you will save on your overhead costs where the other guys won't. With the need for fewer employees you won't get the headaches the other guys get! After becoming a member of the Have Signs Will Travel team, you will spend three weeks in our extensive training program, which is held at our corporate office on Long Island, NY. During this time you will also be able to see the production of your own personalized mobile sign store. Your final week of training will take place on your new truck, accompanied by a Have Signs Will Travel instructor. You will be guided through the actual day to day operation and on your way to an exciting future. All our franchisees will be on our NEXTEL network, this means our dedicated and experienced support staff is always just a click away and can provide any advice or additional information you may need. Your success is our success! Your Have Signs Will Travel mobile sign store will begin as a brand new 18 foot Utilimaster Stepvan. You will receive training on the safe use of this vehicle but no special license is required. After custom paint and lettering is applied to the outside, the inside will also be custom built and the following equipment and supplies will be installed. Your final week of training will take place in your new truck. With this state-of-the-art sign making equipment you will be on the same level as any stationary sign store. 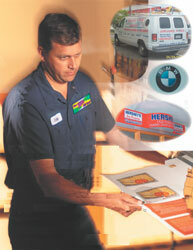 You will be able to manufacture plastic, aluminum and magnetic signs and banners of all sizes. You will also be able to letter vehicles and storefronts. You will be able to print full color decals, vehicle & window graphics, i.e. complete auto wraps, custom stripes for auto detailing - all of which have a high profit margin and are services not offered by many sign shops in-house. Your truck will be stocked with over 70 different colors of vinyl, transfer tape, magnetic material, blank banners, plastic & aluminum sheets - and much more! With this equipment you will be able to design, scan and print sign layouts. Also included is top of the line estimating and accounting oftware. You will be fully trained in its usage during your intensive four week one-on-one training. All the tools that will be necessary to manufacture, install and repair signage will be included in your mobile store. They have been placed in their respective spots to insure that you will be able to operate in an efficient manner.Your starter kit will include a stainless steel toolbox and an assortment of cordless & electric power tools, hand tools, grommet puncher, panel saw, ladder and much more! For you to service your customers whenever & wherever necessary, electricity cannot be a concern. A Have Signs Will Travel mobile sign store produces its own electrical power and even has a backup power source to ensure your ability to get the job done.